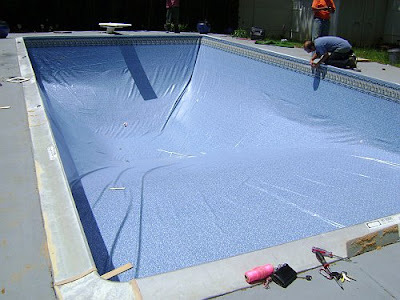 Installing an in-ground swimming pool is a task that might seem daunting, but with the right research and assistance, a pool installation can be carried successfully (including the inclusion of swimming pool cover) with minimal difficulty. There is always a choice between an above ground pool and an in-ground pool, but in-ground pools offer a great deal of advantages and stability. There are other decisions to be made once an in-ground pool has been decided upon. There now comes the question of materials to be used - fiberglass, shell, and tile are all viable options - and choosing the right accessories for the pool. There is absolutely no harm in speaking with an outside pool contractor to survey the site on which the pool is to be built, to estimate cost, and recommend materials for the project. Many people choose fiberglass pools for a few reasons. Fiberglass pools tend to be permanent and flexible, are stronger than concrete and fiberglass can expand up to 12 inches to accommodate any sort of ground movement. Fiberglass also requires less maintenance overall, including lower use (and therefore cost) of chemicals, virtually no need for resurfacing, and the face that the continuous smooth surface does not require acid washing. Other consumers choose concrete pools. This type of pool is also considered permanent, and is more easily installed by a contractor. However, the cost is much higher on average than a fiberglass alternative, despite obviously depending on size and style of the pool. The final choice for an in-ground pool is vinyl. Vinyl liner is simply placed inside support walls made of strong materials such as fiberglass, steel, or various hard woods. One word of caution in choosing a vinyl pool - make absolutely sure that nothing in the ground is likely to puncture the vinyl lining. 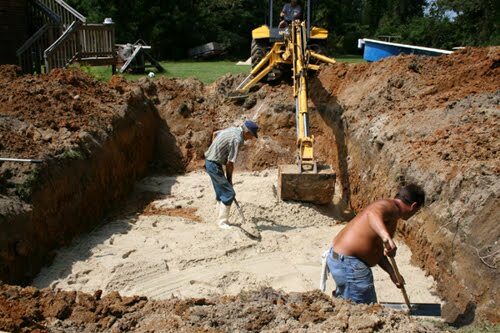 After a material is selected, a homeowner or contractor must dig the area for the pool. Digging this by hand is really not a viable option, and the short-term hire of a crane is often considered the best way of excavating the pool area. A hole for a level pool is easier to excavate than a pool with a shallow and deep end. Each material requires some the installation of a support or grid system, to take the weight of the completed (and filled) pool. 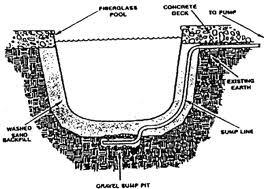 A fiberglass pool is placed by crane in the hole, whereas a concrete pool is poured and cured until the desired results are achieved. Once the placement of the pool is complete, the surrounding area can finished with a deck, an additional concrete patio, or outlying tiles that may also be installed below the waterline for a more detailed look. A final detail that should be considered is the importance of swimming pool covers to protect the pool. Pools benefit immensely from the use of a cover, both in the short term and the long term. Swimming pool covers protect the water from debris and also people from falling into the pool. The most popular covers include solar and winter covers. Although signified as winter covers, these covers can be used year round to prevent falling branches, leaves, etc. from falling into the pool. A solar cover, on the other hand makes pool water warmer by harnessing the sun's rays, with heat from the sun penetrating and being magnified through thousands of bubbles in the cover. Ultimately, choosing which pool and cover to install will often be dictated by your budget - but with so many options available to a potential swimming pool buyer, there are still hundreds of avenues for you to explore if you're looking to augment your property with a swimming pool. 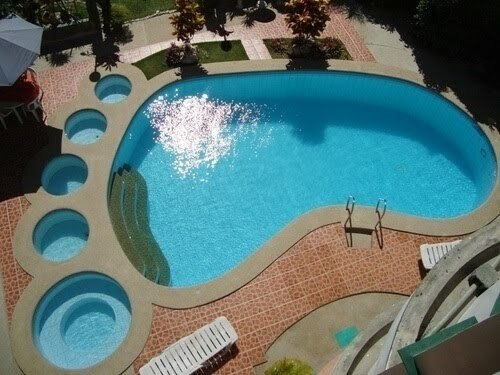 How Do They Build an In-ground Swimming Pool? 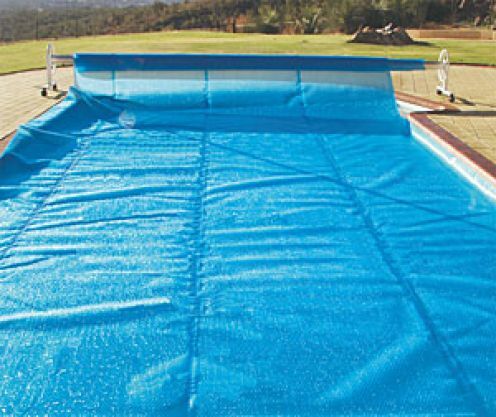 This is a guest post by Poolstore - experts on swimming pools, swimming pool covers and swimming pool accessories. For more information, you can visit Poolstore Swimming Pool Covers. First, that's really a beautiful pool with a very unique design. I enjoyed reading the step by step process of it's construction.